This is "Ruffy" - a year old Chihuahua we have opened our home and our hearts to. We had talked about adopting a small dog several months ago, we had even looked into getting a similar dog but female. Unfortunately they wanted an expensive fee so, we declined and decided to wait until a better opportunity came. Monday evening hubbys friend sent him a txt asking if we wanted to take this Chihuahua. My first question was: Why do you have to get rid of him? According to him, he works a lot and poor Ruffy spent the majority of his first year in a small crate. At first Ruffy made himself look pretty bad by attacking our big Doberman, chasing the cat and peeing in the kids room upstairs, but again he isn't used to a big house with rules so it will take time but he's trainable. I can tell simply by the progress he's made in 24 hours. 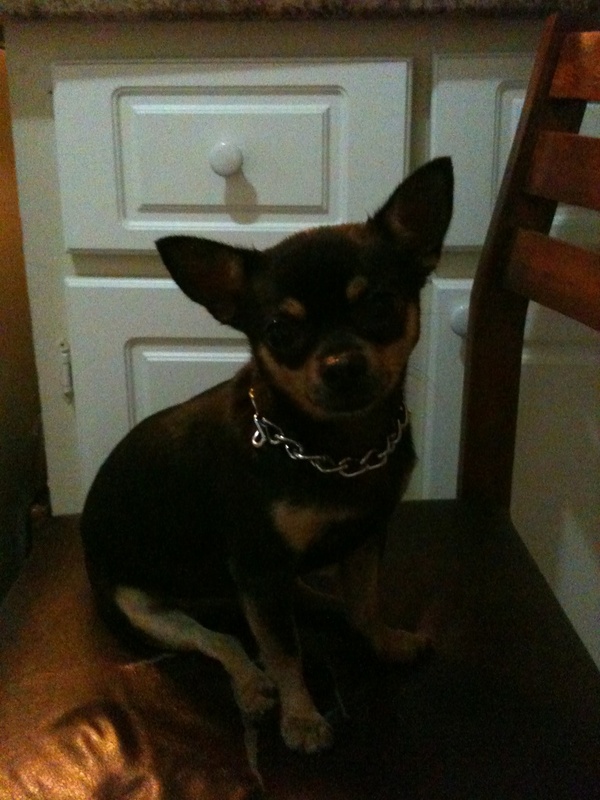 He has the typical Chihuahua attitude and is semi-trained, sits on command, shakes paw & "dances". He's taken to me, enjoys sitting on laps, cuddling and really loves being able to run in the back yard with Zeus who he finally decided he is friends with. Dd adores him, she claimed him "her doggy but moms helping take care of him" ;-) DS is still young and couldn't care less, he thinks Ruffy is a kitty cat. Ruffy likes the kids, he's not aggressive toward people big or small. I think with a little TLC and a lot of patience, he'll be just fine. It's almost as if he's realizing he's not alone anymore and this is what a family is. I'm not one to give up pets, they are beings that needs as much love and attention as a child. It's a commitment and responsibility. It makes me mad when I hear stories like Ruffy's. Bought because he is "cute" yet the owner had no time for him. I'd rather try him out in our home than hear about him ending up in a shelter like a lot do. We'll see how things go, after all you never know unless you try.